Super Bright LEDs, an online retailer for LED lights, added a new dusk­-to-­dawn sensor to its line of landscape lighting accessories. The sensor is designed to save time and energy, as well as prolong LED lifetime, the company said. No indoor wiring or switches are necessary. A built-­in timer allows for lights to remain on for two, four or six hours after dusk. Override options are also available for constant on/off and standard dusk-­to-dawn functionality. The new sensor is designed to plug into Super Bright LEDs’ line of G­LUX landscape lights and can also be used in an existing landscape lighting system with a male pigtail power cable. 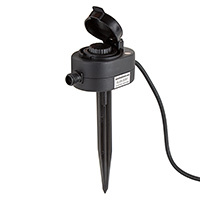 A ground­-mounting stake is included with the sensor. If you enjoyed this article, subscribe to Landscape Management to receive more articles just like it.